Die Veneris, 30° Septembris 1831. Hicks & Williams v. Morant. M. of Anglesey takes the Oaths. M. of Bute's Estate Bill. Fees in Courts of Law Bill. 8th Report on Holyhead Roads & Harbour, &c. delivered. Beer Act, Petition from Runcorn against. 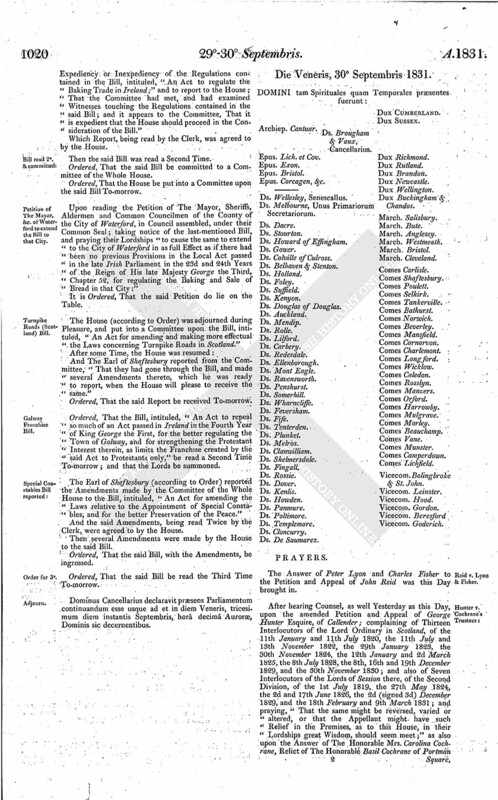 Reform (England) Bill, Petition of Freemen of Exeter for Continuation of their Chartered Rights. Tithes Composition (Ireland) Act, Petition of Clergymen of Ossory, &c. respecting. Wine Duties Bill, Time for entering Protests against 3d Reading, extended. Ds. De Saumarez. Dux Richmond. The Answer of Peter Lyon and Charles Fisher to the Petition and Appeal of John Reid was this Day brought in. It is Ordered, That the further Hearing of the said Cause be put off 'till To-morrow, Half past Ten o'Clock. This Day Henry William Marquess of Anglesey took the Oaths, and also took and subscribed the Oath of Abjuration, pursuant to the Statutes. With a Bill, intituled, "An Act for the Extension and Promotion of Public Works in Ireland;" to which they desire the Concurrence of this House. With a Bill, intituled, "An Act to empower Landed Proprietors in Ireland to sink, embank and remove Obstructions in Rivers;" to which they desire the Concurrence of this House. To return the Bill, intituled, "An Act for effectuating a Partition of Estates belonging to The Most Honorable John Crichton Stuart Marquess of Bute and Earl of Dumfries and The Most Honorable Maria Marchioness of Bute and Countess of Dumfries, and their Trustees, and to The Right Honorable Lady Susan North and to The Right Honorable Lady Georgina North; and for other Purposes;" and to acquaint this House, That they have agreed to the same, with some Amendments, to which they desire their Lordships Concurrence. With a Bill, intituled, "An Act to explain and amend an Act for regulating the Receipt and future Appropriation of Fees and Emoluments receivable by Officers of the superior Courts of Common Law;" to which they desire the Concurrence of this House. With a Bill, intituled, "An Act for appointing Commissioners to continue the Enquiries concerning Charities in England and Wales for Two Years, and from thence to the End of the then next Session of Parliament;" to which they desire the Concurrence of this House. With a Bill, intituled, "An Act for remedying Defects in the Titles to Lands allotted or taken in Exchange under Inclosure Acts;" to which they desire the Concurrence of this House. 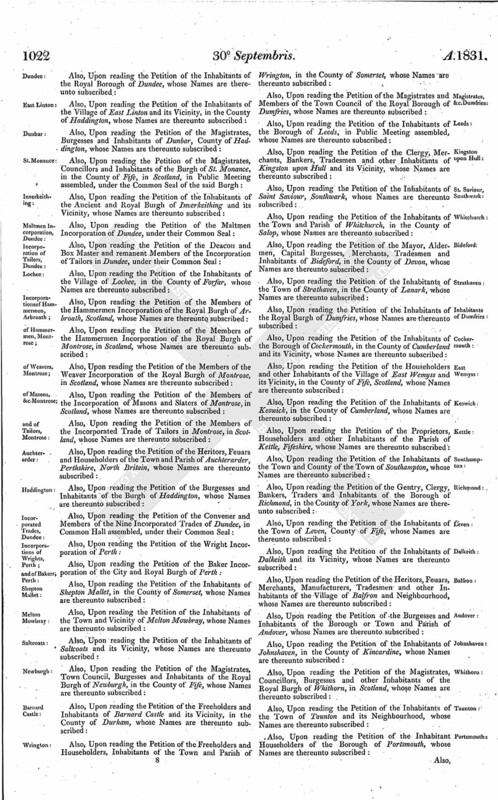 The House proceeded to take into Consideration the Amendments made by the Commons to the Bill, intituled, "An Act for effectuating a Partition of Estates belonging to The Most Honorable John Crichton Stuart Marquess of Bute and Earl of Dumfries and The Most Honorable Maria Marchioness of Bute and Countess of Dumfries, and their Trustees, and to The Right Honorable Lady Susan North and to The Right Honorable Lady Georgina North; and for other Purposes." And, A Message was sent to the House of Commons, by Sir Giffin Wilson and Mr. Roupell, to acquaint them therewith. 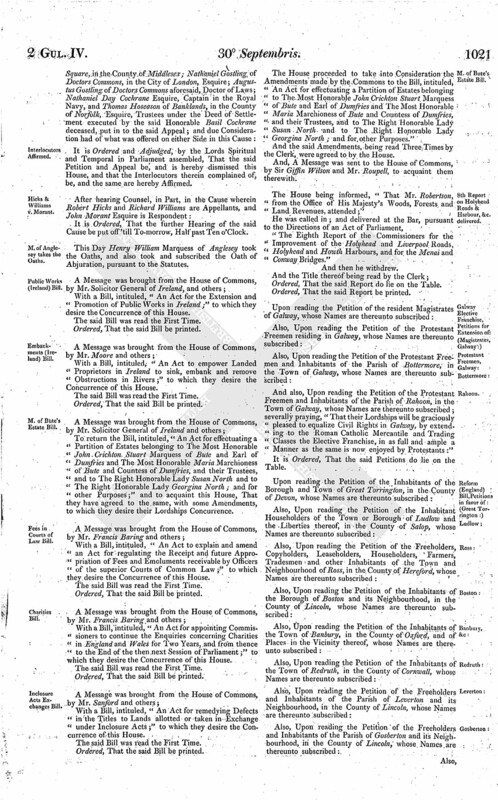 The House being informed, "That Mr. Robertson, from the Office of His Majesty's Woods, Forests and Land Revenues, attended;"
"The Eighth Report of the Commissioners for the Improvement of the Holyhead and Liverpool Roads, Holyhead and Howth Harbours, and for the Menai and Conway Bridges." Ordered, That the said Report be printed. 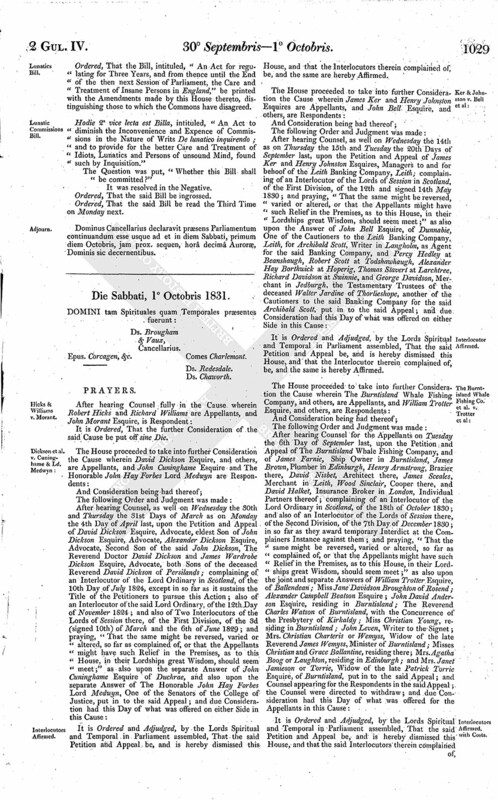 And also, Upon reading the Petition of the Protestant Freemen and Inhabitants of the Parish of Rahoon, in the Town of Galway, whose Names are thereunto subscribed; severally praying, "That their Lordships will be graciously pleased to equalize Civil Rights in Galway, by extending to the Roman Catholic Mercantile and Trading Classes the Elective Franchise, in as full and ample a Manner as the same is now enjoyed by Protestants:"
And also, Upon reading the Petition of the Inhabitants of East and West Stockwith, in the Counties of Lincoln and Nottingham, whose Names are thereunto subscribed; taking notice of a Bill depending in this House, intituled, "An Act to amend the Representation of the People in England and Wales;" and severally praying their Lordships, "That the same may pass into a Law:"
Upon reading the Petition of the Inhabitants of the Parish of Pilton, in the County of Devon, whose Names are thereunto subscribed; taking notice of the last-mentioned Bill, and praying their Lordships "to pass the same with as little Delay as possible, in order that a Legislature may be constituted possessing the Confidence of the Nation, and endowed with the requisite Power to carry into effect those remedial Measures which the Evils of the Country render necessary:"
Upon reading the Petition of the Inhabitants of the Borough of Plymouth, in the County of Devon, and its Vicinity, whose Names are thereunto subscribed; taking notice of the last-mentioned Bill, and praying their Lordships "to give their Assent with all convenient Dispatch to that great National Measure; and that their Lordships will not disappoint the Hopes nor endanger the Safety of the Nation by the Rejection of it:"
A Petition of the Freeholders of the County of Middlesex, duly assembled in County Meeting, was presented and read; taking notice of the last-mentioned Bill, and praying, "That, in order to preserve the Government as by Law established, to give Security to Property, to supply a due Reward for the Labour of the industrious, to restore Tranquillity to the Public Mind, and to prevent National Confusion, their Lordships will be pleased to pass the same with as little Delay as possible." Ordered, That the said Petition be received as the Petition of "Chapman Marshall," and "Wm. Hy. Poland, High Sheriff," who only have signed it. 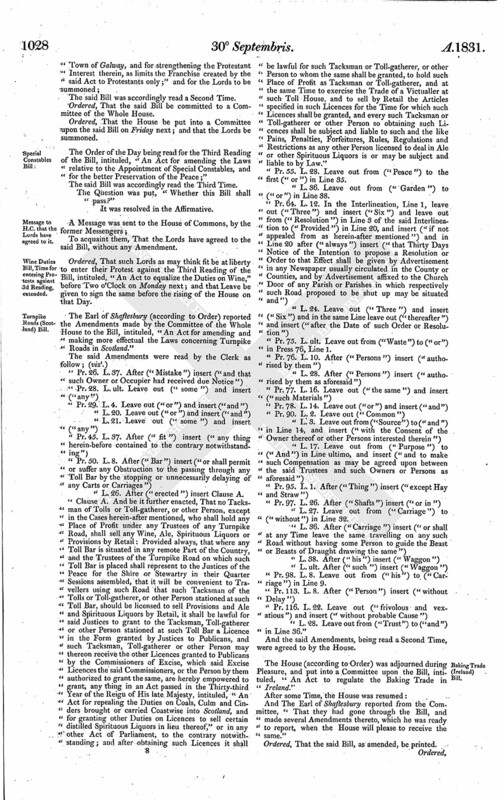 Upon reading the Petition of the Inhabitant Householders of the Ward of Cripplegate Without, whose Names are thereunto subscribed; taking notice of the last-mentioned Bill, and praying their Lordships "to pass the same with the least possible Delay, and thereby preserve the Public Peace and the Constitution, and by the same insure the Tranquillity, Safety and Happiness of the whole Nation:"
And also, Upon reading the Petition of the Inhabitants of Fenny Stratford, in the County of Buckingham, whose Names are thereunto subscribed; taking notice of the last-mentioned Bill, and severally praying their Lordships "to pass the same with the least possible Delay, with the view both of imparting Confidence to all Classes and of securing and improving the great Interests of the Country:"
Upon reading the Petition of the Inhabitants of the Ward of Vintry, in the City of London, agreed to at a Public Meeting, whose Names are thereunto subscribed; taking notice of the last-mentioned Bill, and praying their Lordships "to pass the same with the least possible Delay, both with the view of quieting the Agitation that has so extensively prevailed and for diffusing that Cordiality among the People which is so essential to the Happiness of civilized Society:"
Upon reading the Petition of the Mayor and Inhabitants of the Borough and Parish of Bridgwater and its Vicinity, assembled in the Guild Hall of the said Borough, whose Names are thereunto subscribed; taking notice of the last-mentioned Bill, and praying their Lordships "to tranquillize the Fears and Alarms which agitate the Public Mind, and to ward off the Evils of Civil Anarchy, by speedily giving the Measure their Lordships cordial Concurrence:"
Upon reading the Petition of the Inhabitants of Epworth and its Vicinity, in the Isle of Axholme, in the County of Lincoln, whose Names are thereunto subscribed; taking notice of the last-mentioned Bill, and praying their Lordships, "That the same, in consequence of the intense Desire of the Country for the Accomplishment of a Measure deemed necessary for securing to the Throne, the Parliament and the People, the full and lasting Possession of their relative Constitutional Rights, may be passed; and that their Lordships will be pleased to agree that the said Bill may speedily pass into a Law:"
Upon reading the Petition of the Inhabitants of the Parish of Ferry Port on Craig, in the County of Fife, whose Names are thereunto subscribed; taking notice of the last-mentioned Bill, and praying, "That their Lordships may be pleased to pass the same, that the Institutions of the Country may be handed down to Posterity, not only unimpaired, but greatly enlarged:"
Upon reading the Petition of the Magistrates, Town Council, Incorporated Trades and Burgesses of the Burgh of Mussleburgh, under their Common Seal, and of the Inhabitants of the said Burgh, whose Names are thereunto subscribed; taking notice of the last-mentioned Bill, and praying their Lordships "to pass the same, and thereby remove all Discontent and possibility of Disorder, and unite all Orders of Society, thereby conferring a lasting Blessing on the Nation at large:"
And also, Upon reading the Petition of the Hammermen Trade or Incorporation of Dundee; taking notice of the last-mentioned Bill, and severally praying, "That their Lordships will be pleased to pass the same, without any Alteration tending materially to diminish the Influence of the People in Parliament:"
Upon reading the Petition of the Deacon, Boxmaster and remanent Members of the Incorporation of Cordiners of the Royal Burgh of Dundee; taking notice of the lastmentioned Bill, and praying their Lordships, "That the same may pass into a Law in its present Form, and with the least possible Delay, thereby conferring upon the People that Share of Political Power which their Knowledge, Virtue and Loyalty entitle them to possess, and will prevent them from abusing:"
Upon reading the Petition of the Members of the Incorporation of Tailors of Arbroath, whose Names are thereunto subscribed; taking notice of the last-mentioned Bill, and praying their Lordships "not to be deceived by the Representations of interested Persons, that the People are become regardless as to the Fate of the same, and that their Lordships will give their Sanction to the passing of the said Bill into a Law, with as much Expedition as is consistent with the Importance of the Question and the Dignity of their Lordships House:"
Upon reading the Petition of the Inhabitants of Strathmiglo, Fifeshire, whose Names are thereunto subscribed; taking notice of the last-mentioned Bill, and praying their Lordships "to pass the same, and thereby confer a lasting Blessing on the Nation, remove all Discontent and all possibility of Disorder:"
Upon reading the Petition of the Inhabitants of Dartford, Crayford, and their Vicinities, whose Names are thereunto subscribed; taking notice of the last-mentioned Bill, and praying their Lordships, "That the same may immediately pass into a Law, as the Rejection of a Measure of such vital Importance to the People of England may be fraught with Consequences too serious to contemplate:"
Upon reading the Petition of the Inhabitants of Sunderland and Bishop and Monk Wearmouth, in the County of Durham, whose Names are thereunto subscribed; taking notice of the last-mentioned Bill, and praying their Lordships "to give their early Sanction to a Measure approved by His Majesty's Ministers, supported by the House of Commons, and on which the Voice of the Country has already been so unequivocally expressed:"
Upon reading the Petition of the Inhabitants of the Town and Parish of Gateshead, in the County of Durham, whose Names are thereunto subscribed; taking notice of the last-mentioned Bill, and praying their Lordships, "as the Hereditary Guardians of British Liberty, to unite with our Gracious Monarch, and His grateful and devoted Commons, in perfecting this great Measure of Constitutional Renovation, which will not only restore the Harmony of the Country, by dispelling those gloomy Forebodings which the unhappy Consequences of continued Abuses in other Countries are calculated to inspire, but will cause the Acts of the present Parliament to be recorded amongst the most glorious Annals of this long happy Land:"
Upon reading the Petition of the Magistrates, Town Council, Heritors, Burgesses and other Inhabitants of the Royal Burgh of Kinghorn and Vicinity, whose Names are thereunto subscribed; taking notice of the last-mentioned Bill, and praying their Lordships "to consider the perilous State of the Country, and not utterly disregard the almost unanimous Voice of the Nation, by magnanimously yielding their Assent to the said Bill without Mutilation or unnecessary Delay:"
Upon reading the Petition of The Mayor and principal Inhabitants of the Town of Falmouth, assembled at the Guild Hall of the said Town, whose Names are thereunto subscribed; taking notice of the last-mentioned Bill, and praying their Lordships, "That the same may obtain their Assent with as much Expedition as the Rules of Parliamentary Proceedings will permit, thereby contributing to allay the great Degree of Excitement which at present prevails throughout the Kingdom, and to increase the Veneration and Attachment the Petitioners have always entertained for the Noble and Hereditary Branch of the Legislature:"
And also, Upon reading the Petition of the Operatives of Glasgow, taking notice of the last-mentioned Bill, and severally praying their Lordships "to consider the awful Responsibility which they undertake in deciding on this great Measure of National Redemption from Political Wrong and Oppression; and without any vexatious Delay, or partial and frivolous Emendation, that their Lordships will promptly and generously assent to the ardent Wishes of a loyal, industrious and free People, by speedily passing the said Bill into a Law:"
Upon reading the Petition of the Inhabitants of the Parish and Borough of Totnes, in the County of Devon, whose Names are thereunto subscribed; taking notice of the last-mentioned Bill, and praying their Lordships "to prove themselves propitious to the Interests of the People, by giving their Sanction to a Measure which can alone restore the Constitution to its true and legitimate Principles, promote the general Prosperity, and avert the calamitous Consequences of a National Revolution:"
Upon reading the Petition of the Kidderminster Political Union, and other Inhabitants of the Town, whose Names are thereunto subscribed; taking notice of the last-mentioned Bill, and praying their Lordships, "That the same may pass, as the Petitioners are convinced that all our imperfect Institutions would, by a reformed Parliament, be prudently, gradually and safely ameliorated:"
Upon reading the Petition of the Inhabitants of the Borough of Scarborough and its Vicinity, whose Names are thereunto subscribed; taking notice of the last-mentioned Bill, and praying, "That their Lordships, to prevent great and certain Calamities, will be pleased to pass this necessary Bill with as little Delay as possible, and thereby preserve the Public Harmony, the Form and Principles of the Constitution, and thus ensure to Posterity the Blessings of a wisely-regenerated Government, calculated to promote the Happiness and Prosperity of all Classes in this great Empire:"
Upon reading the Petition of the Inhabitants of the Town of Thurso, in the County of Caithness, whose Names are thereunto subscribed; taking notice of the last-mentioned Bill, and praying their Lordships "to receive and entertain the same, and with as little Delay as may be consistent with its due Consideration to present it at the Foot of His Majesty's Throne for His gracious Assent, thereby conferring an inestimable Boon on the British Nation, and securing to their Lordships an additional Claim to the Respect and Gratitude of their Fellow Subjects:"
Upon reading the Petition of the Inhabitants of the Parish of Saint Mary, Newington, in the County of Surrey, whose Names are thereunto subscribed; taking notice of the last-mentioned Bill, and praying their Lordships "forthwith to pass the same into a Law, without any Alteration of its leading Principles, as the best Means of giving encreased Stability to the Throne, and restoring to the People that Share in the Representation of which they have been so long and so unjustly deprived:"
Upon reading the Petition of the Householders and Inhabitants of the Parish of Paddington, in the County of Middlesex, whose Names are thereunto subscribed; taking notice of the last-mentioned Bill, and praying their Lordships "to view the same, not as a designed Infringement upon the real Dignity and proper Influence which belong to their high Station as Peers of the British Parliament, but as a salutary Concession to the just Demands of those Classes of British Subjects below their Lordships in Rank, and generally inferior to their Lordships in Wealth and Influence, but not inferior to them in their Knowledge of the Principles upon which the Government of this Kingdom was established, nor in their Capability of estimating the Advantages secured to them by the Constitution in its perfect Integrity; and that their Lordships will not withhold their Consent to a Measure so eminently calculated to concentrate Men of all Ranks and Opinions in One universal Desire to uphold and maintain the Honor, Peace and Security of the Country:"
Upon reading the Petition of the Inhabitants of the Parish of Saint Paul, Covent Garden, in the Liberty of Westminster, in Public Meeting assembled; taking notice of the last-mentioned Bill, and praying their Lordships "to facilitate by every possible Means the passing of the same, and thereby allow Thousands of taxed but unrepresented People to have a Voice in the Expenditure of their Country; and that their Lordships will give this National Grievance their most serious and deliberate Consideration, and pass the said Bill into a Law, as the best Means of giving Stability to the Throne, Protection to the People's Rights and Liberties, and a lasting Prosperity to the Country:"
Upon reading the Petition of the Glover Incorporation of Perth; taking notice of the last-mentioned Bill, and praying, "That their Lordships will concur with the Commons in passing the same, as the only sure Means of securing the Peace of the Country, and procuring for themselves that Respect and Gratitude which a well-timed Concession to the Wishes of the People will necessarily produce:"
Upon reading the Petition of the President and Members of the Liverpool Ciceronian Society, established and convened for the Purposes of Philosophical Disputations and Literary Debate; taking notice of the last-mentioned Bill, and praying their Lordships "favorably to investigate and expeditiously to pass the same, which the Petitioners consider a Measure pre-eminently calculated to consolidate the happy Union of the Three great Estates of these Realms, by giving each Party its due Share in the Administration of Political Affairs:"
Upon reading the Petition of the Deacon, Convener and Deacons of and as representing the Six Incorporated Trades of the City of Brechin, Scotland, in Common Hall assembled, whose Names are thereunto subscribed; taking notice of the last-mentioned Bill, and praying, "That the same may speedily receive their Lordships Approval, and be passed into a Law, as the only Means of maintaining the Stability of our Political Institutions and of the Peace and Prosperity of the Country:"
Upon reading the Petition of the Weaver Incorporation of Arbroath, Scotland; taking notice of the last-mentioned Bill, and praying their Lordships, "by adhering to the Principle of the same, to confer, not only a great Boon on His Majesty's Subjects of Great Britain and Ireland, but render an essential Service to this ancient Corporation:"
And also, Upon reading the Petition of the Inhabitants of the Town of Biggleswade and its Vicinity, in the County of Bedford, whose Names are thereunto subscribed; taking notice of the last-mentioned Bill, and severally praying their Lordships "to expedite the passing of the same into a Law, as the best Means of averting those Evils which must result from a Denial of the just Rights and Expectations of the People:"
Upon reading the Petition of the Dean and Incorporation of the Merchant Guild of the Royal Burgh of Montrose, in Scotland, in Common Hall assembled, under their Common Seal; taking notice of the last-mentioned Bill, and praying their Lordships "to pass the same into a Law, as being founded on Constitutional Principles, and as tending to uphold and consolidate the established Order of Government, and as calculated to allay that feverish Anxiety which so universally prevails, and to meet the Desire and Expectation of the great Body of His Majesty's dutiful and loyal Subjects:"
And also, Upon reading the Petition of the Inhabitants of the Town and County of the Town of Poole, whose Names are thereunto subscribed; taking notice of the last-mentioned Bill, and severally praying their Lordships, "That the intense Desire of the Country for the Accomplishment of a Measure deemed necessary for securing to the Throne, the Parliament and the People, the full and lasting Possession of their relative Constitutional Rights, may be granted; and that the said Bill may pass into a Law:"
Upon reading the Petition of the Inhabitants of the Parishes comprising the District called Roseland, in the County of Cornwall, whose Names are thereunto subscribed; taking notice of the last-mentioned Bill, and praying, "That their Lordships will, in conformity with the Wishes of our benevolent and magnanimous Sovereign, and the Wants and Desires of His affectionate, loyal and united People, give their Consent to the great Principles of the said Bill, and with the least possible Delay pass it into a Law, that the Nation may speedily obtain the great Benefits of its Enactments:"
A Petition of the Parishioners of St. Mary le bone, assembled at a Meeting, was presented and read; taking notice of the last-mentioned Bill, and praying, "That their Lordships will pass the same into a Law, without any Alteration or Amendment which shall in any way deteriorate from the Advantages which it will confer on the People of England." Ordered, That the said Petition be received as the Petition of "Joseph Hume, Bryanston Square, Chairman," and the other Parishioners only who have signed it. 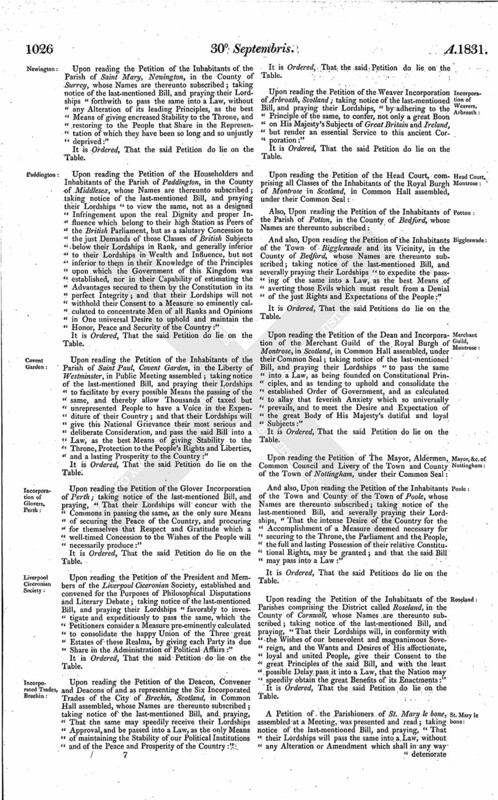 A Petition of the Inhabitants of the Town and Parish of Woolwich, in the County of Kent, in Vestry assembled, was presented and read; taking notice of the last-mentioned Bill, and praying their Lordships "to pass the same into a Law, because it will tend to the Tranquillity and Prosperity of the Nation." Ordered, That the said Petition be received as the Petition of "B. Pidcock, Churchwarden, Chairman," who only has signed it. 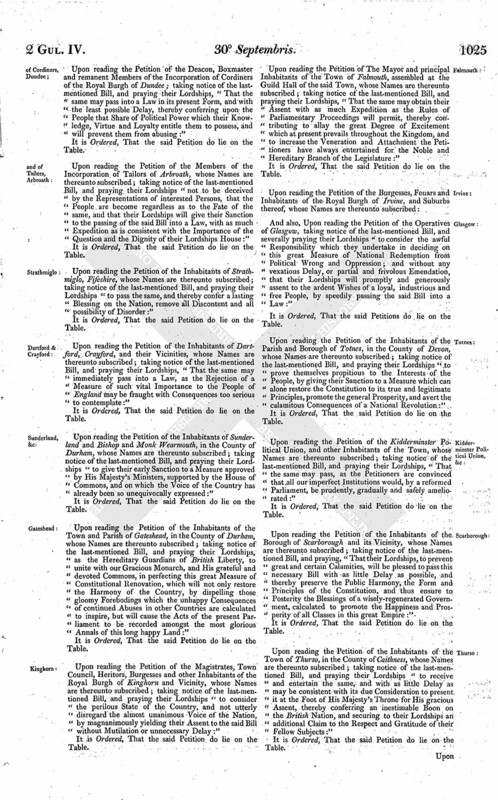 Upon reading the Petition of the Clergy, Ministers of Religion, Churchwarden and other Inhabitants of the Township of Runcorn and its Vicinity, in the County of Chester, whose Names are thereunto subscribed; praying their Lordships, "That the Act for permitting the general Sale of Beer and Cyder by Retail in England, to which, in the Petitioners View, the growing Intemperance and Immorality amongst their Workmen, the Mischiefs continually arising to the Public Peace, to private Families, to the Cause of Order, Morals and Religion, are chiefly to be ascribed, may be revised, amended or repealed, as shall seem best to their Lordships:"
Upon reading the Petition of the Freemen of the City of Exeter, whose Names are thereunto subscribed; taking notice of a Bill depending in this House, intituled, "An Act to amend the Representation of the People in England and Wales;" and praying their Lordships for the Continuation of their Chartered Rights proposed to be curtailed in the said Bill, which the Petitioners submit have never been abused, but on the contrary always fairly and honestly exercised:"
Upon reading the Petition of the Beneficed Clergymen of the Dioceses of Ossory, Leighlin and Ferns, whose Names are thereunto subscribed; praying their Lordships "to render the Tithe Composition Act imperative in all Parishes that have hitherto rejected its Adoption, notwithstanding the manifest Benefits which it is designed and calculated to confer:"
Ordered, That the said Bill be read the Third Time on Friday next; and that the Lords be summoned. Ordered, That the said Amendments be taken into further Consideration on Friday next; and that the Lords be summoned. It was moved, "That the said Bill be now read the Third Time." Ordered, That the Debate on the said Motion be adjourned during Pleasure. To return the Bill, intituled, "An Act to amend the Laws in England relative to Game;" and to acquaint this House, That they have agreed to their Lordships Amendments made thereto. Then the Debate on the Motion, "That the Bill, intituled, "An Act to equalize the Duties on Wine," be now read the Third Time," was resumed. "1st.-Because it was proved in the Debate that the Methuen Treaty had been renewed by and was incorporated into the Treaty of Commerce and Navigation signed at Rio de Janeiro on the Nineteenth of February One thousand eight hundred and ten, and that its Execution was to be regulated by the Stipulations of that Treaty. 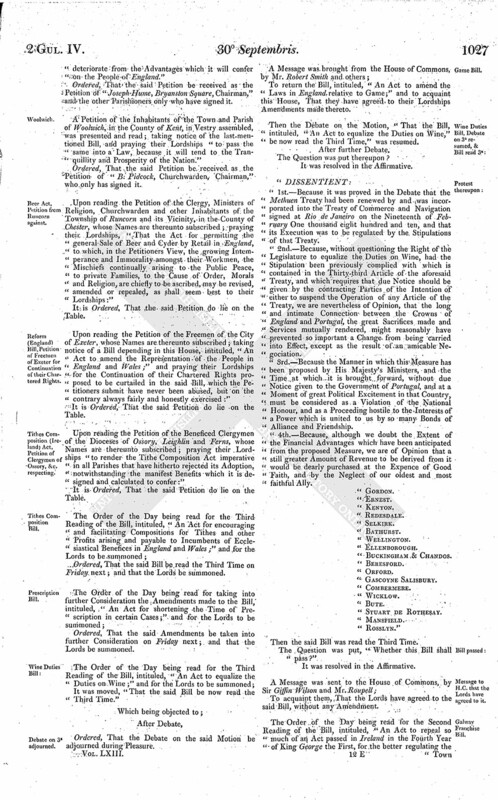 "2nd.-Because, without questioning the Right of the Legislature to equalize the Duties on Wine, had the Stipulation been previously complied with which is contained in the Thirty-third Article of the aforesaid Treaty, and which requires that due Notice should be given by the contracting Parties of the Intention of either to suspend the Operation of any Article of the Treaty, we are nevertheless of Opinion, that the long and intimate Connection between the Crowns of England and Portugal, the great Sacrifices made and Services mutually rendered, might reasonably have prevented so important a Change from being carried into Effect, except as the result of an amicable Negociation. "3rd.-Because the Manner in which this Measure has been proposed by His Majesty's Ministers, and the Time at which it is brought forward, without due Notice given to the Government of Portugal, and at a Moment of great Political Excitement in that Country, must be considered as a Violation of the National Honour, and as a Proceeding hostile to the Interests of a Power which is united to us by so many Bonds of Alliance and Friendship. "4th.-Because, although we doubt the Extent of the Financial Advantages which have been anticipated from the proposed Measure, we are of Opinion that a still greater Amount of Revenue to be derived from it would be dearly purchased at the Expence of Good Faith, and by the Neglect of our oldest and most faithful Ally. Ordered, That the House be put into a Committee upon the said Bill on Friday next; and that the Lords be summoned. 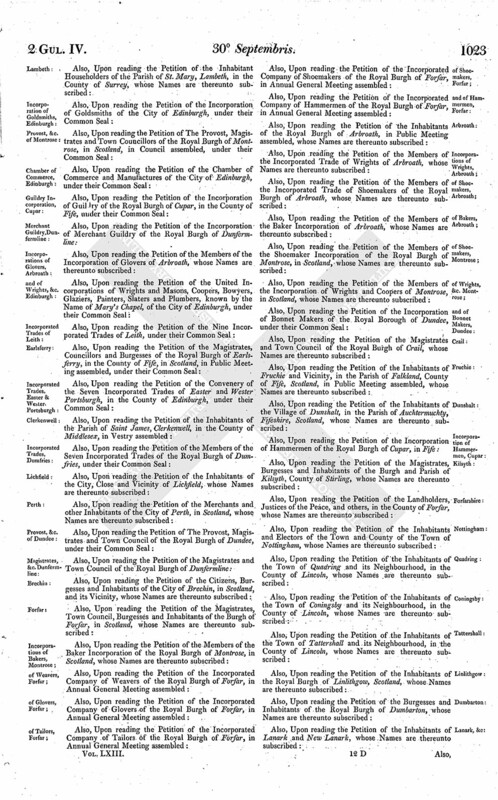 The Order of the Day being read for the Third Reading of the Bill, intituled, "An Act for amending the Laws relative to the Appointment of Special Constables, and for the better Preservation of the Peace;"
Ordered, That such Lords as may think fit be at liberty to enter their Protest against the Third Reading of the Bill, intituled, "An Act to equalize the Duties on Wine," before Two o'Clock on Monday next; and that Leave be given to sign the same before the rising of the House on that Day. The Earl of Shaftesbury (according to Order) reported the Amendments made by the Committee of the Whole House to the Bill, intituled, "An Act for amending and making more effectual the Laws concerning Turnpike Roads in Scotland." "L. 26. After ("erected") insert Clause A. "Clause A. And be it further enacted, That no Tacksman of Tolls or Toll-gatherer, or other Person, except in the Cases herein-after mentioned, who shall hold any Place of Profit under any Trustees of any Turnpike Road, shall sell any Wine, Ale. Spirituous Liquors or Provisions by Retail: Provided always, that where any Toll Bar is situated in any remote Part of the Country, and the Trustees of the Turnpike Road on which such Toll Bar is placed shall represent to the Justices of the Peace for the Shire or Stewartry in their Quarter Sessions assembled, that it will be convenient to Travellers using such Road that such Tacksman of the Tolls or Toll-gatherer, or other Person stationed at such Toll Bar, should be licensed to sell Provisions and Ale and Spirituous Liquors by Retail, it shall be lawful for said Justices to grant to the Tacksman, Toll-gatherer or other Person stationed at such Toll Bar a Licence in the Form granted by Justices to Publicans, and such Tacksman, Toll-gatherer or other Person may thereon receive the other Licences granted to Publicans by the Commissioners of Excise, which said Excise Licences the said Commissioners, or the Person by them authorized to grant the same, are hereby empowered to grant, any thing in an Act passed in the Thirty-third Year of the Reign of His late Majesty, intituled, "An Act for repealing the Duties on Coals, Culm and Cinders brought or carried Coastwise into Scotland, and for granting other Duties on Licences to sell certain distilled Spirituous Liquors in lieu thereof," or in any other Act of Parliament, to the contrary notwithstanding; and after obtaining such Licences it shall be lawful for such Tacksman or Toll-gatherer, or other Person to whom the same shall be granted, to hold such Place of Profit as Tacksman or Toll-gatherer, and at the same Time to exercise the Trade of a Victualler at such Toll House, and to sell by Retail the Articles specified in such Licences for the Time for which such Licences shall be granted, and every such Tacksman or Toll-gatherer or other Person so obtaining such Licences shall be subject and liable to such and the like Pains, Penalties, Forfeitures, Rules, Regulations and Restrictions as any other Person licensed to deal in Ale or other Spirituous Liquors is or may be subject and liable to by Law." "Pr. 55. L. 28. Leave out from ("Peace") to the first ("or") in Line 35. "L. 36. Leave out from ("Garden") to ("or") in Line 38. "Pr. 75. L. ult. Leave out from ("Waste") to ("or") in Press 76, Line 1. "L. 27. Leave out from ("Carriage") to ("without") in Line 32. "Pr. 98. L. 8. Leave out from ("his") to ("Carriage") in Line 9. "L. 28. Leave out from ("Trust") to ("and") in Line 36." The House (according to Order) was adjourned during Pleasure, and put into a Committee upon the Bill, intituled, "An Act to regulate the Baking Trade in Ireland." 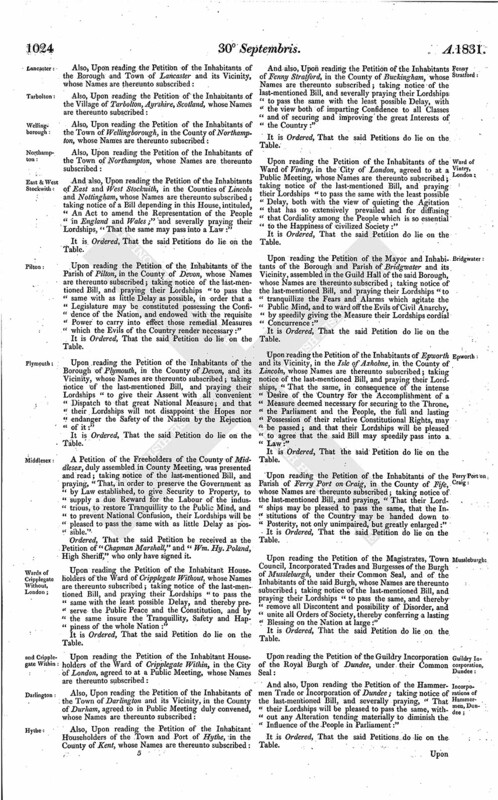 Ordered, That the Bill, intituled, "An Act for regulating for Three Years, and from thence until the End of the then next Session of Parliament, the Care and Treatment of Insane Persons in England," be printed with the Amendments made by this House thereto, distinguishing those to which the Commons have disagreed. Hodie 2a vice lecta est Billa, intituled, "An Act to diminish the Inconvenience and Expence of Commissions in the Nature of Writs De lunatico inquirendo; and to provide for the better Care and Treatment of Idiots, Lunatics and Persons of unsound Mind, found such by Inquisition." Dominus Cancellarius declaravit præsens Parliamentum continuandum esse usque ad et in diem Sabbati, primum diem Octobris, jam prox. sequen, horâ decimâ Auroræ, Dominis sic decernentibus.